There was an easy win for Oundle in the first round of the Northants Twenty/20 Cup last night (May 30). 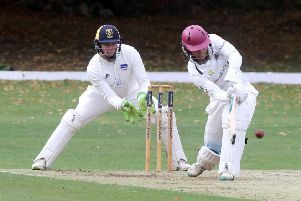 The Premier Division side entertained Weekley & Warkton from Division One and cruised to a nine-wicket win. The visitors were bowled out for 82 in 16 overs with Harrison Craig (3-13), Jack Boslover (3-21) and Keiron Jones (2-14) the cheif wicket-takers. Then they raced to 83-1 in just 4.5 overs with Mark Hodgson smashing an unbeaten 32 off 15 balls and Hanno Kotze 25 off just 10 deliveries. Hodgson hit three sixes and two fours and Kotze one six and four fours. The gamne at Peterborough Town against Higham Ferrars never took place. Higham Ferrars conceded the tie.